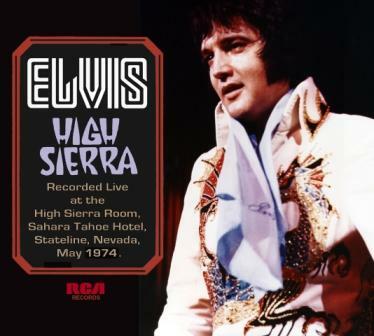 Most of the shows Elvis did during his May 1974 Lake Tahoe engagement were of a high standard. The May 21 midnight show recently released by FTD as High Sierra is no exception. The repertoire is certainly a varied one, and with Elvis in good form, the end result is an entertaining and pleasant show. "We're gonna do our best to entertain you, you know, sing songs, drink water and walk around ... go streaking later. All of us, you gotta do it too, I ain't going by myself, I'll be in jail tomorrow," Elvis kids the audience and later on changes a line in a powerful version of "Trying To Get To You" to "I kept streaking all the way, baby trying to get to you." Some of the songs during the first part of the show aren't that exciting, though. "All Shook Up," "Love Me Tender" and "Hound Dog" are done in the usual style and "You Don't Have To Say You Love Me" as well as "Suspicious Minds" are a bit sloppy, especially the latter one. But things get better during the second half, with one highlight after another. "Help Me" is performed flawlessly and "Bridge Over Troubled Water" is delivered in great style, a strong version indeed. "Big Boss Man" has a funky arrangement and "The First Time Ever I Saw Your Face" is beautifully sung, including a different line on the third verse: "And the first time, ever I held you close" instead of "And the first time, ever I laid with you." "I like that song," Elvis exclaims at the end. I do too! Seven bonus tracks from the same engagement rounds off the album, including "Spanish Eyes" and "I'm Leavin'" All in all High Sierra is a fine release, even including a booklet (although not a very impressive one, only eight pages with no liner notes, just the track listing together with ten photos in varied quality, six of them so small you can hardly make out Elvis.) You could do worse than buy this one. That said, if you don't own copies of the two classic bootlegs from the December ’76 tour, Burning In Birmingham (re-released as High Voltage) and A Hot Winter Night In Dallas (re-released as At Full Force), I would recommend you spend your money on the official FTD pairing release Showtime! instead. Here you can read why.